First Sevy, Hicks, and now Dellin? Who’s worried? Doesn’t look good for the Spankees. Probably looks better than whoever you root for. They’ll still crush the Twins in the Wild Card game. Bernies Dander, I know you’re a Mets’ fan, who likes to frequently troll, Yankee pages. The Mets have been to a World Series more recently than the Yankees have. The Yankees have been mostly irrelevant for a decade despite outspending everyone over that period. Just saying…. Yankees have won World Series more recently, than the Mets. 2nd place trophy, is not a thing. I’m just reminding you how much of a non-factor the Yankees have been since 2009(and really since acquiring Arod, actually). 15 years with 1 World Series appearance and nearly $3B spent on payroll. Cashman is totally and completely overrated. This is Brodie Van Wagenen‘s first year GM. Cashman’s been Yankee GM for 20+ years and counting. Not one season below .500. Tell me, what was ‘17 Mets record? After 11-2 start? Last Mets’ WS was 1986? Before that 1969. Doesn’t matter if they win 120 games if they don’t win the World Series. How long has that been? This is true. Cashman made his reputation on Gene Michael’s success. Cashman has mostly been a flop on his own. 10 long years. By the way toddfather how long has it been for your team? They have mancaves on the golf course!? so how longggggg have you been been deep kissing your sister? Bernie, what you are not saying is how much of a factor the Mets have been since 2009, right? Except for 2015 when ONE hot 2B player crushed it through the playoffs; combined with genius “TC” blowing through sensible innings’ limits (and thereby not sticking up for his pitchers long term wellness) the Mets have absolutely sucked for the past 18 years. Has your anti-depressant medicine destroyed your memory? Now please don’t come back with Flushing excuse number one, Bernie Madoff. So it’s time to crawl under your rock little boy. Mommy will bring you new meds after you take your nap. Todd, will you invite us to your Bar Mitzvah? Hey Marty-that is a sensitive question. Todd’s not having one as Todd Senior lost all of his $$ investing with Bernie Madoff. Real objective. Not a fan of you. I like objective posts, replies not you…. Hey Todd-you are so cute with your anger. Real men don’t hide their allegiances, so you must be a mets fan in hiding. We know that your parents spanked you as a child. HEY IQ55, lost another arm I see. Every time you post smack about MY TEAM you lose another, and another, and another—–BOOYAH- To real Yankee fans that only to mikeyank55, I know real baseball fans know the difference but IQ55 hurts your team when he post/trolls my team. Oh 4ever—I’m Glad that you are winning in whatever you are rambling about. I post here to remind everyone of the truth about your Metsies and to sway fans from wasting their money and lives supporting a team who’s owners have been making a mockery of NL baseball in NY for so long. So I’m now guessing that since the Metsies are “MY TEAM” you are probably one of the Wilpon grandchildren, huh? Grandpa is getting senile isn’t he? It’s good that they take you to Chitifield for your birthday parties. When you grow up you should tell the cheapskates that you want more than hotdogs. How about Shake Shack for your 18th birthday? We all know that he won’t spring for beers on your 21st. It takes nerve for a Met fan to make fun of anybody. How’d the Cespedes signing work out.How about extending David Wright?That worked out fine right. And I’m sure D’Arnaud will work out real soon.And great move signing Jay Bruce.And nice pickups with Lowrie and Frazier .Maybe one year you’ll win your division.Were you even born the last time that happened? The Yankees have been to the World Series ONCE since they got Arod. And most of us were in Middle School when that happened. I mean, the iPhone hadn’t even come out yet at that time. And, yet, Yankees fans flex their muscles and tell everyone to “count their rings” like they can even remember when the Yankees were relevant themselves. You forgot about Kei Igawa. Oh, and Brian Cashman has about 20 bad drafts in a row where he messed up pick after pick. And you forever have your hand inside your zipper when you are watching your team. If that’s the only way to get excitement then perhaps you need a new team. Or perhaps it’s not, huh? Well Bernie, using your great math skills how many World Series has your team chalked up. Word of caution: real men are referring to championships, NOT division championships, NL championships,almost championships, or championships except we just fell a little short. Remember if not for Daniel Murphy the Mets would have been eliminated in the NLDS in 2015. And what did they do with their post season MVP? Obviously NOT sign him to a new contract. So here’s part B-when was then last time the Mets won 100 games. That’s at least a sign of relevance right? When was your team relevant? Was it ever relevant? Lol what bout calling them the “Chokees”? Well, they DID blow a 3-0 series lead in 2004. It’s hard to be bigger chokers than that, wouldn’t you agree? Remember when your CF tool strike 3 in Game 7 of the NLCS. Only the Mets can bring out loser qualities in a moment for Carlos Beltran. And so all teams make bad signings. The one that tops them all is the one the team is paying for 30 years later. Maybe that causes Fred to sign up with Bernie Madoff? It’s time for you to get your wife to change your adult pampers. Even though they are too large it’s a good idea. Not a bit, injuries happen. Able replacement for Hicks, deep bullpen will help cover Dellin, Sevy hurts but arms are always an issue. Just need to score runs – Judge, Stanton, Sanchez, Volt/Bird, a more mature Torres, Andujar, etc. Greg Bird is up next. Homer alert. Yankee bullpen is leaps and bounds better than Bosox bullpen, prob best in MLB, even w/o Dellin. Yea no I’m 100% joking. Red Sox bullpen is trash. Just love seeing how fired up people get here. But the league is so bad honestly I’m not sure how much it will hurt them. I think I know why Yankee fans only want to compare bullpens. I’ll give you coaching? Not Front Office. I’m sorry but Yankees rotation looks way better than Boston. They already have 2 ace pitchers in Sevy and Paxton. Tanaka also has the tools to round back to ace form this season. They are in the process of getting Gio Gonzalez which is a solid 4/5 pitcher in that rotation. Outside of Sale and maybe Price, Red Sox have no one in that rotation, and that includes the inconsistency of Eovaldi. The Yanks hitters could also give the Sox a run as well with some of the upgrades they made this season. On paper despite injuries here early on, they still should have the best record in the division with the weaknesses the Sox have in the bullpen and starting rotation. When exactly did the Yankees buy a World Series? X, did you happen to count how many homegrown Redsox players they have in the starting 9, the joint the Ckokees. Front Office? Seriously. Cashman’s terrible. Highest payroll by a long shot in this century and Yankees have ONE World Series. Red Sox have four. The object is to win WS’s not have above .500 seasons. . The rest of the league loves the fact that Yankees fans love him. Keep up the good work Cashy. I think I know why Red Sox fans only want to compare wins. in the grand scheme of time perspective is the reallllly a difference between the last 19 years vs the last 23? yankees win 5 and Red Sox 4. Yankees front office is awful. Cashman spent more than everyone else for 15+ years and only managed to win once. They haven’t even been to any other World Series over that timeframe. Cashman is a total fraud. Hey 4ever….you don’t want your Metsie owners buying a WS. That’s why you are so happy watching a hopeless team every summer and fall. Nice. Do they put handcuffs on you when you are thrown in the back of the horse trailer? Dude? I’m a Red Sox fan, but dude!? High? Drunk? Both? C’mon. Even the Red Sox would take the Yankees bullpen over their own. Then you’re just delusional. You can hate them but don’t let it blind you or you’ll just make a fool of yourself. There is no way you can actually argue that the Red Sox have the better bullpen. Even if they resigned Kimbrel it would still be worse then the Yankees. wtf. I’d take Chapman over the whole Red Sox bullpen. Chapman is good when he’s on, but he gets wild and gives it up a lot more often than he should. LOL good luck with that mess. DAMN. And you people accuse me of trolling. As an opposing hitter, you mean? Hey baron1-time to renew your script for meds. Your balance is way offf. And the drugs your on??? Hey Josh-you are going to have to take the Sox bullpen as is. 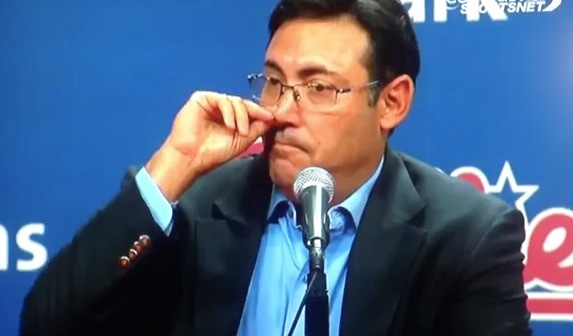 Trader Dave emptied the farm system so there will be no replacements and nothing attractive to flip at the deadline. Aside from 1 series against Houston and 1 series against Boston in March/April, Yankees have a light schedule. They will be fine. Trim Reaper -U said the same thing before on a post & Ill say the same reply: many a pennant was lost with a bad April! All months count ! Division title or Wild Card, the Yankees will make the playoffs with or without Dellin. Relax. I said they’d be fine. I didn’t say anything otherwise. Nice try. Not going to feel bad about another Yank being injured, but what is it w these guys? So many players getting hurt this spring. I always figured w the big salaries and not having to work in the off season, they would all be in pretty good shape coming to ST.
Did they sign him to a six year extension first? I think the sharp decline in velocity and now this injury revelation foreshadows a serious injury with Dellin. I would suit up myself and report to Spring Training by tomorrow but my only demand is I wear #3. Great job Cashman – I’ve beennsain that Yanks we’re weak with not enough coverage for starting pitchers – older guys… then Severino, then CC etc … Glad Gio is aboard, but now bullpen woes start ? And you think the rest of season will not be any different as they play more? We are exposed !. Come on Cash – spend the fing $$ & get that #3 starter FA! No more pitchers want to sign with the Yankees. They are afraid of their medical staff. There is a reason there are still starting pitchers on FA, you get buy with four the first month, then plug in the young guys. No one left out there. Dellin was asked about his lack of velocity a week or so ago. He said he wasn’t worried about it. You’ve opened up a roster spot for Tyler Wade and now the Orioles look better. Sarge you’re falling down on the job, because you’ve had way better troll attempts in the past. Mr. Chinwood, I am upvoting your comment. Was kinda hoping for a John Gant/Tyler Wade trade! Yanks have others that can shoulder the load. I can understand the Yanks not wanting to lose Wade, but none of the other Yanks’ options have a proven track record like Gant, who can start or relieve. It’s just like the moronic NCAA calling the play-in games the “first round” of the tournament, and the actual first round was called the second round. Nobody ever referred to it as that, and they eventually dropped it. No worries Bomber peeps. We’re still way better than the rest and will be even better. In Cash We Trust. Damn – to all the people who called this issue out when the post was about Delim throwing high 80’s to low 90’s – kudos. What’s up with tommy khanle?